Q & A with Bernie – December 3, 2012 | Bernie Siegel M.D. First of all, I want to personally thank you for helping me beat this disease. I have had breast cancer twice. The second time, back in 1988, I attended a seminar at Bower’s Museum in Santa Ana, CA where you spoke about love, a positive attitude, using guided imagery, and the importance of diet to help heal by strengthening the immune system. You also suggested that patients who were single should get a lap dog, not a cat, to give love to by petting the dog. You told us that it was calming to the soul and had been shown to even lower our blood pressure. The doctor I was seeing for this second occurrence of breast cancer told me I would mostly likely die within the year, but I believe that attending your seminar and reading your book Love, Hope and Miracles gave me the tools to heal myself and I am still cancer free, almost 25 years later! P.S. do you remember saying that statement regarding being single and getting a lap dog? Yes, I most certainly did say those things that you remember from the 1988 seminar in California except I honestly don’t remember saying “no” to cats. I love cats, too. They are very loving and have the same effect on blood pressure as well as bringing people “out of themselves” as dogs do. We have two dogs and four cats. 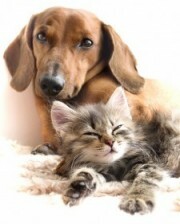 As most of my readers know, I believe that pets boost survival statistics with all diseases. Their unconditional love for you, “their human” along with the soothing calm just quietly enjoying time together provides, has been shown time and again in actual medical studies to be of great benefit to how the body handles disease. One of the greatest innovations in the last 20 or so years, I believe, is “Therapy dogs” and “Therapy cats” that are taken into hospitals and skilled nursing facilities, often stimulating patients positively who have not been able to react to anything else. Relationships are the key factor in changing our body chemistry with the “Live life” message. This entry was posted in Animals, Mind / Body Medicine, Q & A with Bernie, Relationships and tagged Bernie Siegel, breast cancer, Hope and Miracles, Love, pets and blood pressure, pets and healing, Therapy dogs and cats. Bookmark the permalink.